What Are the Treatments for Breast Cancer Following Surgery? The news that you or a loved one has breast cancer, changes your life forever. After you receive the appropriate medical treatment (usually surgery), the next step is to explore what are the available breast cancer treatment options following surgery. The post-surgery treatments relate to the type and stage of breast cancer, as well as the type of surgery you received. Discuss your options with your doctor, so you can make an informed decision. Discuss Breast Cancer Treatment Options with Your Doctor. [Image Permission: Stefano Valle / FreeDigitalPhotos.net]. Chemotherapy, often referred to as simply “chemo," is a treatment that uses a variety of medicines to destroy any residual cancer cells at the surgery site, and/or to weaken and destroy cancer cells that have spread to other parts of the body. The chemo infusion is usually accomplished via intravenous (IV) drip tubes, although other methods include injections, through a port or catheter, or orally in pill or capsule form. Chemo is a “systemic" treatment, since it works through a person’s bloodstream, which in turn affects the entire bodily system. Individuals with cancer cells that have spread to lymph nodes. Premenopausal women with invasive breast cancer. Women with aggressive early stage breast cancer. Chemo often includes a combination of medicines, known as a chemotherapy regimen. The regimen therapy includes types of medicine, dosage, and duration of treatment. Your doctor bases his or her decision for your regimen based on the specific details of your cancer, your menopausal status, and your general health. Overall, your doctor weighs the benefits with the potential side effects to determine the best regimen for you. 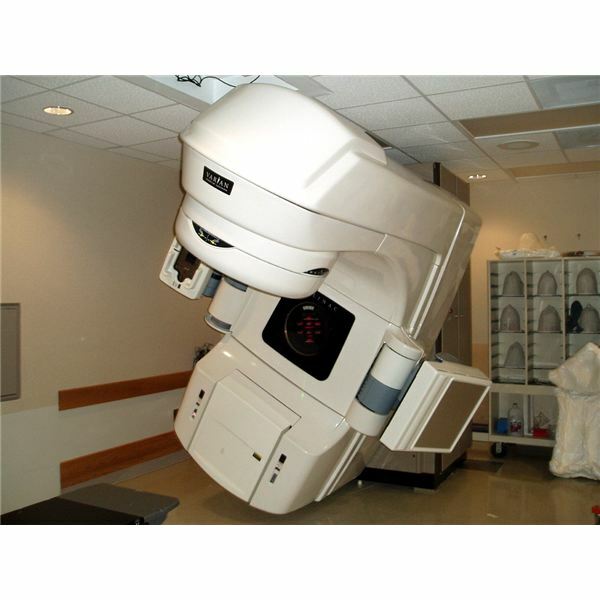 Linear accelerator machine: delivers radiation from outside the body through highly focused, strategically controlled conditions. Radioactive pellets or seeds: give off radiation beams from inside the body. Lumpectomy patient whose cancer was: early stage; smaller in size (4 centimeters or less); situated in one location; and successful lump removal with clear margins. Mastectomy patient whose cancer was: larger in size (5 centimeters or more); invasive toward lymph nodes, breast blood vessels or skin; spread into lymph nodes (one for premenopausal women, four or more for other women); and “positive margin of resection" obvious in removed breast tissue. [Treatment options continued on second page]. [Image Permission: Wikipedia/Wikimedia Creative Commons]. yields significant decrease in risk of recurrence. BreastCancer.org emphasized that post-surgery hormonal therapy is NOT the same as hormone replacement therapy (HRT). Hormonal therapy lowers the amount of estrogen produced in a woman’s body and disrupts any activity of estrogen on breast cancer cells. Hormonal therapy is a systemic treatment that targets the “hormone-receptor-positive breast cancers" that account for about 80 percent of breast cancers; it is NOT designed for “hormone-receptor-negative breast cancers." The main function of hormonal therapy as a post-surgery treatment is to reduce the risk of recurrent breast cancer. Your doctor determines the best hormonal therapy medicine for you based on several factors, including your menopausal status, any history of blood clots or arthritis, your bone density, your personal risk of uterine or ovarian cancer, and your current stage of breast cancer. A breast cancer diagnosis is both frightening and life changing. Your doctor can discuss with you what are the treatments for breast cancer and help you choose the best treatment options following surgery, based on your needs and overall health. Choices may include chemotherapy, radiation therapy, hormonal therapy, targeted therapies, complementary or holistic medicine, or some combination of therapies. Your doctor will base his or her decision for your therapy regimen after weighing the benefits vs. the side effects, to arrive at the best post-surgery treatments for you.